Hughes Enterprises, a leading packaging and shipping solutions provider, launched an exciting new website in April. The new site has been built to reflect the way customers search for packaging and shipping solutions and will make it easier for customers to access detailed product information and informative videos. 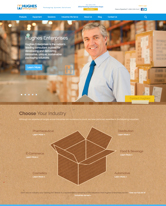 Hughes Enterprises, the East Coast’s leader in packaging and shipping solutions, recently redesigned its website (http://www.hughesent.com) to provide the ultimate user-friendly experience. Visitors can now explore its modern, new look, built with improved navigation and functionality throughout. The new site which has been built to reflect the way customers search for packaging and shipping solutions will make it easier for customers to have access to detailed product information and informative videos. Responsive Design: Created with the user experience firmly in mind, the new website has been designed using the latest responsive technology, allowing the site to flex and adapt to a wide range of browsers and mobile devices. Streamlined Navigation: Simplified menus and a stronger industry focus, enable visitors to quickly locate the relevant packaging and shipping solutions through multiple different entry points. Customer-Driven Content: The new website has been completely rewritten, incorporating direct customer feedback and usability data, offering more useful, richer online content that is easier to navigate and understand by the end user. Industry Insights: On the Hughes Enterprises blog page, visitors can now stay informed with Hughes’ perspective on the latest news in the shipping and packaging industry, product features, productivity and ergonomic tips, green packaging and more. More than Products and Equipment: New site organization emphasizes Hughes’ real differentiating factor—their ability to evaluate big picture operational requirements and objectives, translating them into efficient end-to-end packaging system solutions for clients. Hughes’ new site presents extensive product information in a comprehensive format. Now, customers can understand and compare the complete range of professional packaging equipment, shipping materials and integrated packaging solutions available. Technical data, brochures, videos and application case studies work together to provide a detailed overview of Hughes’ capabilities across a wide range of industries, making it easier for the customer to understand and evaluate their options. Headquartered in Trenton, NJ, with ten regional sales offices, Hughes Enterprises Packaging Systems Solutions has been providing top of the line service for more than 65 years. Consistently earning high marks from customers for meeting and exceeding expectations, Hughes strives to find the right solution for any company’s packaging and shipping needs. As the leading provider of packaging equipment, integrated packaging solutions, and shipping, packaging and sanitary supplies for more than 65 years, Hughes Enterprises is the East Coast’s leading end-to-end packaging systems resource. With programs such as vendor controlled inventory and special stocking agreements, Hughes Enterprises can help clients reduce inventory and provide just-in-time deliveries, with highly competitive pricing. As a member of Packaging Distributors of America (PDA), Hughes has the capabilities to service companies on a national scale, with superior customer service.